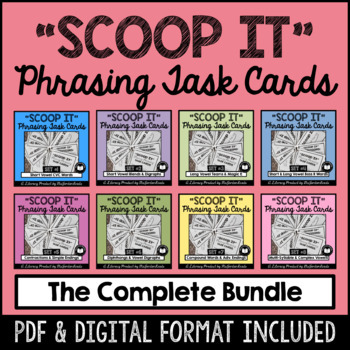 For each set, 24 task cards already include scoop lines (marking phrases) for your students to practice reading with appropriate phrasing. 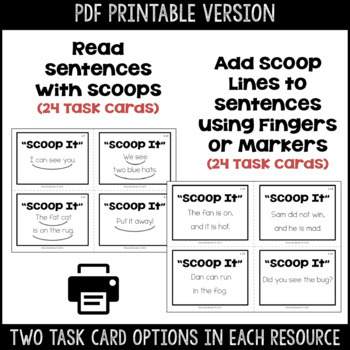 The other 24 task cards do NOT include scoop lines and provide the opportunity for your students to draw in the scoop lines. (A self-check page is provided for independent literacy centers.) Assessment pages are included in each set for you to monitor student progress with phrasing. Have students complete the fluency task cards for morning bell-work, Daily 5, literacy centers, or as take-home task card sets. All you have to do is print, laminate, and cut! You can even use as a PDF and display using a SMARTboard or projector. 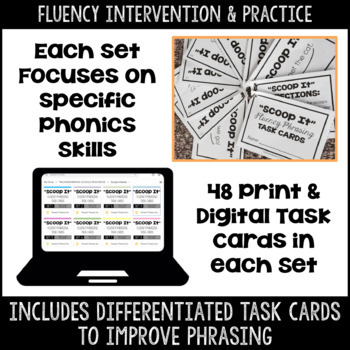 Interested in other FLUENCY task cards? Check out my comprehensive Daily Fluency Task Card series! MsJordanReads is a "One Stop, Fluency Shop"-- Grab additional FLUENCY resources HERE! Please email me at msjordanreads@gmail.com with any questions or comments.